Martinborough is renown for producing premium grapes, which in turn produce world-class, award-winning wines. The international trophies abound for a region that produces just small percentage of the nation’s fine wines. But no one’s bragging about it. Each day the townsfolk carry on about their business, with world-renowned viticulturists and wine-makers enjoying their flat whites and muffins at one of the village cafes and chatting with tourists. When you visit one of the local wineries it is likely to be the owner who greets you at the cellar door – or a relative. Family-owned and operated wineries are what this wine region are all about. Wander round the leafy, tree filled square and meander through the village to one of the many wineries all within walking distance of the main square. Vineyard lunches and a great deal of good wine to be drunk mean you will need to take time to settle into the pace of village life and spread this experience over a few days. It’s stone-filled river terraces provide the perfect terroir for growing premium grapes with surrounding mountains protecting the area from harsh elements. The long hot and dry autumn allows the grapes a longer “hanging time” than most regions – making yields lower and increasing flavour intensity. Scheduled for the 21st of November this year, it’s a great way to enjoy the latest vintage of Martinborough Wine and launch into summer. Now in its 19th year, the Toast Martinborough festival has become a highlight on the gourmet calendar. For many far-flung families and friends, it is also an opportunity for an annual get together. The limited release of 10,000 festival tickets are snapped up within hours every year. Festival celebrations are scattered across 9 participating vineyards, all of which are within walking distance of Martinborough village. Each will serve food, prepared by Wellington and Wairarapa’s finest restaurants and chefs, carefully matched to complement and enhance the winemaker’s selection, alongside live music from some of the most popular Kiwi bands and entertainers. A special feature is the opportunity to sample wines specifically reserved for the Toast Martinborough festival. Visitors can wander between vineyards throughout the day or simply linger under a shady tree and enjoy the music, wine and people watching. Transport and parking hassles are eliminated by the close proximity of vineyards and free shuttle buses running all day. 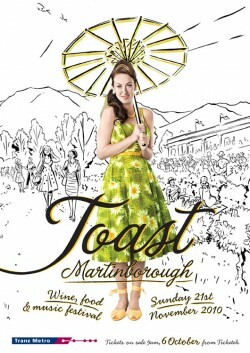 Tickets for Toast Martinborough go on sale on 6 October. With tickets being so sought after it is recommended you join the Friends of Martinborough for preferential booking and packages available exclusively to Friends of Martinborough members.